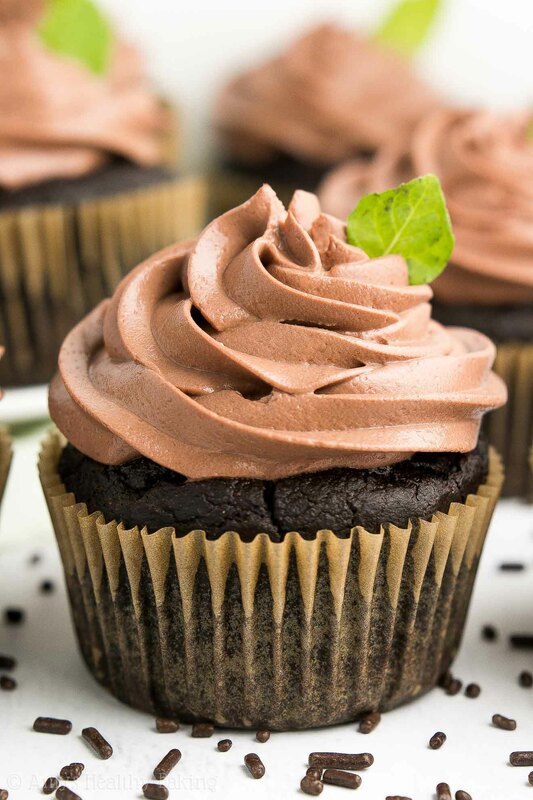 Supremely rich & tender mint chocolate cupcakes topped with chocolate frosting! They’re surprisingly easy to make, just 97 calories & taste like Thin Mint cookies! A couple of times each year throughout my childhood, my family drove to the hills out towards the bay to spend time with some good family friends. Mom and Dad had gone to college with the gentleman, and he and his wife had two kids about the same age as my brother and me. Since his wife was born and raised in Italy, she loved to cook and prepared gourmet dinners during our visits. Those meals always included some type of pasta, which my brother and I really looked forward to! While the adults chatted in the kitchen, offering to help the woman with chopping and sautéing and washing dishes, we kids knew to stay out from underfoot! 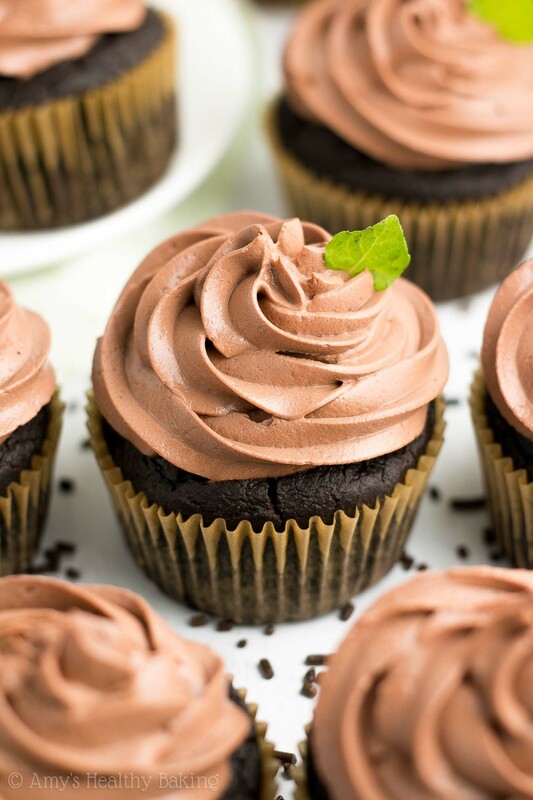 When I baked this batch of Healthy Mint Chocolate Cupcakes and topped them with tiny fresh mint leaves, I giggled a bit at that memory… I’m proud to report that my taste buds have matured and now enjoy fresh mint—as well as mint chocolate sweets like these! 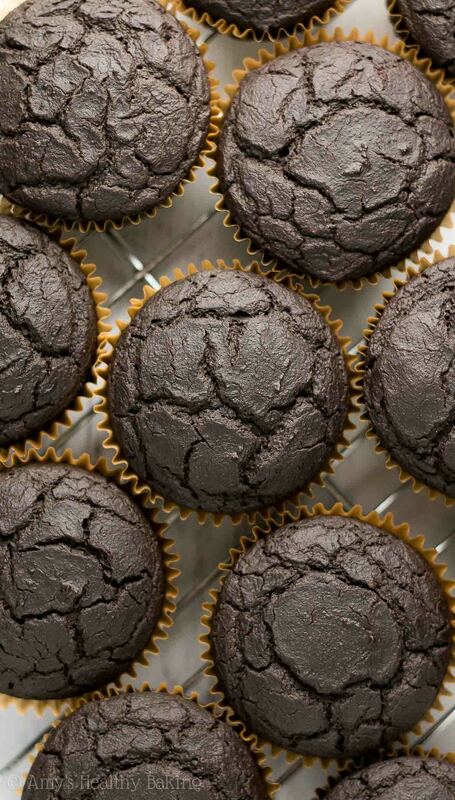 Although they look like they came from an upscale bakery with those stunning swirls of chocolate frosting… These healthy cupcakes are actually really easy to make! They also contain no refined flour or sugar—and just 97 calories, including the frosting! With how much candy my childhood self ate, I might not have cared back then… But I’m super excited about how healthy and delicious these mint chocolate cupcakes are! 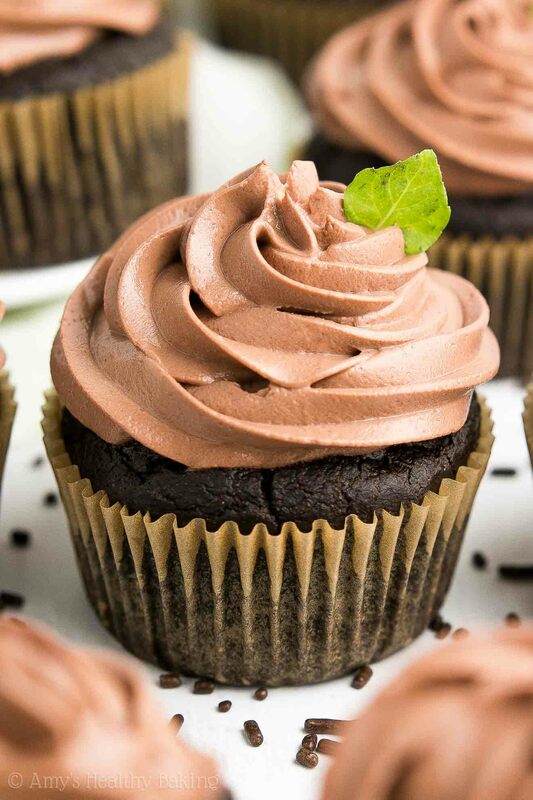 Let’s start with talking about how to make the mint chocolate cupcakes first! You’ll begin with cocoa powder (like this!) and white whole wheat flour (like this!). 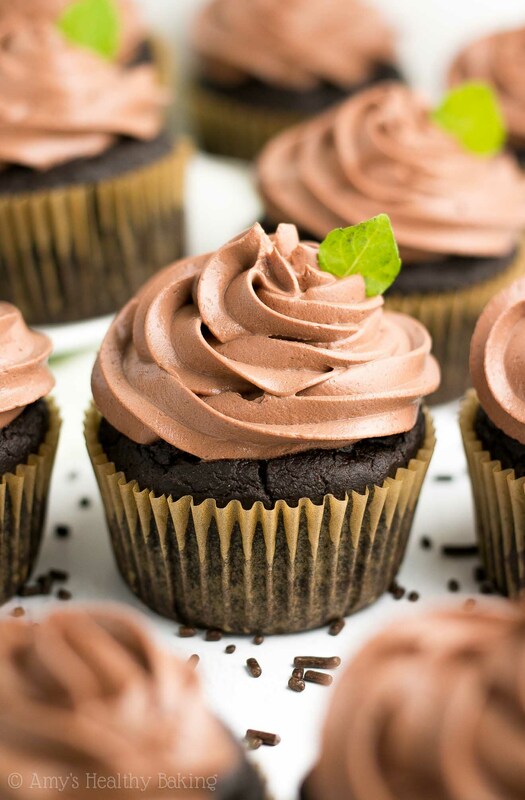 You’ll actually use more cocoa powder than flour in these cupcakes, which gives them an extremely rich and chocolaty flavor… Without any melted chocolate OR special dark cocoa powder! Just use the regular unsweetened variety! And yes, white whole wheat flour actually exists! It’s not a combination of white (aka all-purpose) flour and whole wheat flour. Regular whole wheat flour comes from a heartier variety of red wheat, whereas white whole wheat flour comes from softer white wheat (hence the name!). This gives white whole wheat flour a lighter taste and texture, which is perfect for these healthy cupcakes! Remember to measure the cocoa powder and flour correctly, using this method or a kitchen scale. (← That’s the one I own and love!) 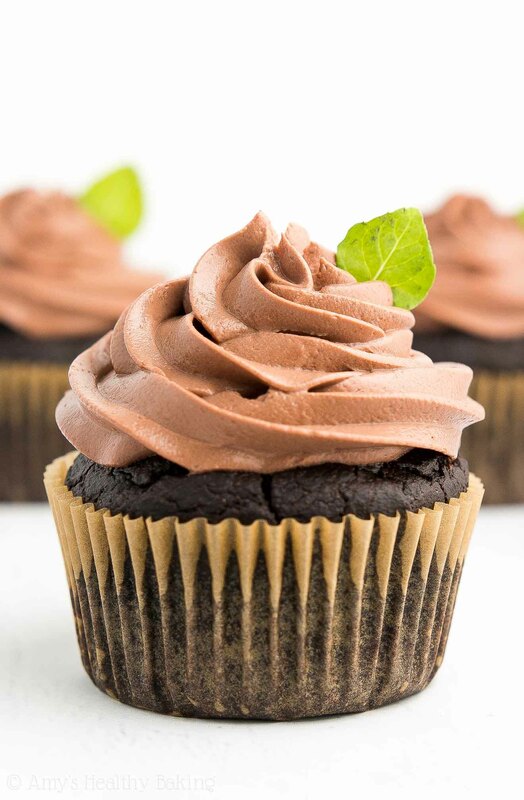 Too much of either ingredient will dry out your cupcake batter, and too much cocoa powder will make your cupcakes taste bitter. Not good! So let’s measure correctly so we can enjoy these supremely rich cupcakes! Unlike traditional recipes or boxed mixes that require lots of oil or butter, these healthy mint cupcakes only need 1 tablespoon! The rest of their tender texture comes from Greek yogurt. You know how much I love baking with it! Greek yogurt adds the same moisture to your batter as extra butter or oil but for a fraction of the calories… And it gives your cupcakes a protein boost too! 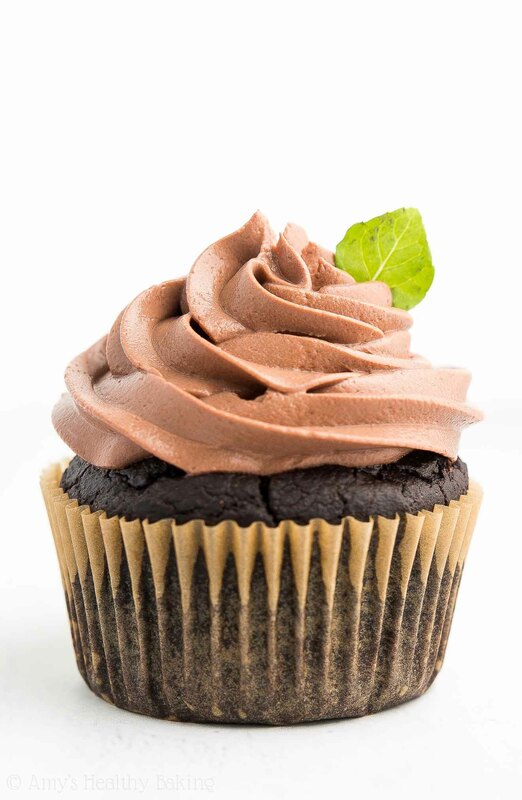 You’ll sweeten your healthy mint chocolate cupcakes with another one of my favorite ingredients: vanilla stevia. Stevia is a plant-based, no-calorie sweetener that contains nothing refined or artificial (aka it’s clean-eating friendly!). Of course, we can’t forget the last really important component… Peppermint extract! It’s much stronger than fresh mint leaves (and less expensive too! ), so you just need a little bit. Remember to coat your cupcake liners with cooking spray before dolloping in your healthy cupcake batter! Low-fat batters like this one tend to stick to liners like superglue… But misting them with cooking spray first means the liners will easily peel away! While your cupcakes bake, it’s time to prepare the frosting! It actually starts with… More Greek yogurt! Sounds crazy, doesn’t it?? But Greek yogurt’s thick and creamy texture makes great frosting when combined with instant pudding mix (like this)! That second ingredient thickens the Greek yogurt even further, giving it a pipe-able consistency. Then to boost the chocolaty flavor, you’ll mix in a bit of cocoa powder (like this! )—and a little more vanilla stevia (like this!) for sweetness. Enjoy! And when you make your own, remember to snap a picture and share it on Instagram using #amyshealthybaking and tagging @amyshealthybaking IN the photo itself! (That guarantees I’ll see your picture! ?) I’d love to see your cupcakes! These cupcakes remind me of Thin Mint cookies! They’re full of rich chocolate and bright mint flavors, and they’re supremely tender. The chocolate frosting is such an irresistible finishing touch! The cupcakes will keep for at least three days (if not longer!) if stored in an airtight container in the refrigerator. Divide the batter between the prepared paper liners. Bake at 350°F for 21-24 minutes or until the centers feel firm to the touch and a toothpick inserted into the center comes out clean. Cool in the pan for 5 minutes before transferring to a wire rack to cool completely. While the cupcakes bake, prepare the frosting. Add the Greek yogurt, cocoa powder, instant pudding, and vanilla stevia to a large bowl. Beat with an electric mixer for 2 minutes. Cover the top of the bowl with foil, and refrigerate for at least 2 hours. Once the cupcakes have completely cooled, pipe the chocolate frosting on top just before serving. Notes: For the gluten-free flour, use the following blend: ½ cup (60g) millet flour, ¼ cup (30g) tapioca flour, ¼ cup (30g) brown rice flour, and ¾ teaspoon xanthan gum. Most store-bought gluten-free flour blends (like this!) should work as well, if measured like this. I highly recommend using the vanilla stevia! It’s one of my favorite ingredients (you’ll use it in all of these recipes of mine! ), and I buy it online here because that’s the cheapest price I’ve found. If you prefer not to use stevia in the cupcakes, substitute ¾ cup (180mL) of agave, honey, or pure maple syrup for the vanilla stevia. Reduce the milk to ¼ cup + 2 tablespoons (90mL) if using any of those liquid sweeteners. (The batter should be fairly thick, similar to muffin batter.) If you prefer not to use the vanilla stevia in the frosting, then substitute 1 ½ teaspoons of this powdered stevia OR ¼ cup of Truvia or granulated sugar. If you prefer plain chocolate cupcakes, then just omit the peppermint extract. You just need the dry instant pudding mix (like this! )—don’t prepare it according to the package directions! For a more classic spreadable (not pipe-able) chocolate frosting that does NOT use instant pudding (and is clean-eating friendly), use this recipe of mine. Haha oh yes, fresh mint is definitely potent! 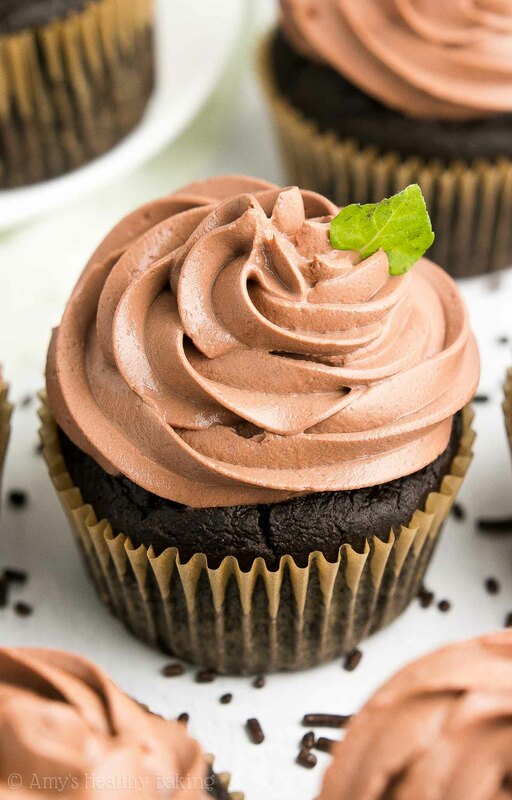 I too prefer mint with chocolate, where the chocolate dominates; and these cupcakes are the perfect treat with that combination. Help please I am unsure how much instant pudding to use.I made these and used 2 boxes of the chocolate pudding! I know that was a big mistake so I need to remake and use the correct amt, please help me.LOVE your blog and recipes!!!! This looks so good, but I prefer to use cane sugar in my baking because my body seems to tolerate it better. Can sugar be substituted for the stevia? Is there a reason for using just egg whites? Can we use the whole egg? Yes, you can use 2 whole eggs if you prefer! Since some family members have high cholesterol, I try to limit the use of egg yolks when possible so they can enjoy my baked goods too. 🙂 I’d love to hear what you think if you try these cupcakes! 2. Wanted chocolate cupcakes so skipped the mint part. 3. Dint find stevia so used agave. The result was a not very sweet dark chocolate cupcake that was moist and delicious. Wanted your thoughts on the sweetness. Is the sweetness low because its meant to be balanced with the frosting or probably due to the agave?